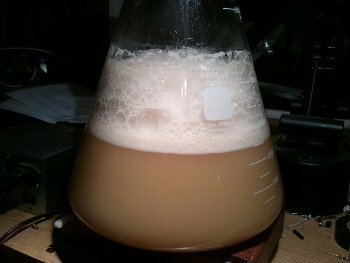 I started homebrewing in early 2008 after getting a beginner's kit as a Christmas gift. I actually asked for it since I had seen my father-in-law homebrewing for a few months and thought that it would be a fun hobby to take on (he had actually done it for years but stopped for a while and had just started again). I think the bane of my existence is the rather wide variety of hobbies that I have. They can be time consuming if you don't watch it. The wonderful thing about homebrewing coupled with the fact that I'm a pretty curious guy (meaning that I am interested in knowing how the world works and why it works the way it does) is that it can be as involved as you want it to be. After a few tries, you can make pretty good beer at a fraction of the cost of what you'd find in the grocery stores. Plus, the horse piss they call beer (e.g., Budweiser, Miller, Coors, etc) pales in comparison to the stuff you can make even early on. In the beginning, I enjoyed making my own beer because...well, just because I could enjoy something that I had made myself. It tasted good and cost on average about $0.50 per bottle. Over time, however, it has become more of a science to me. I am fascinated by the fact that so many variables can be changed over the course of brewing a batch of beer that can affect it in drastic ways. In effect, you start with a bunch of grains (mostly malted barley), some flowers (hops), water, and yeast. That's it! After a few weeks, you can bottle or keg your beer. A few weeks later (usually a month in total), you have drinkable beer! And it lasts a good while too. As opposed to drinking your beer very quickly as you might do with beers you purchase in the store, you can keep your homebrews for a year or more. Some beers only start to become good after several years and keep for 8 or more! Hops and living yeast act as preservatives. Commercial breweries pasteurize their beers, thereby killing the yeast. They filter it too. Homebrew is unfiltered. I've had some good brews (e.g., stouts and barleywines) that were in the bottle for several years and tasted incredible! I initially began brewing extract brews. So in addition to the four ingredients to brewing mentioned above (grain, hops, water, and yeast), there's also malt extract; that's just a syrup or dry powder that's derived from steeping malted barley at certain temperatures for a duration in order to extract the fermentable sugars contained within the grain (actually, enzymes in the grain convert starches to sugars). Using malt extract saves you a lot of time and the headache of trying to extract those sugars yourself which is usually not as efficient and requires additional equipment, techniques, and a lot of patience. Plus, the variables I mentioned before increase exponentially; there are more of them to worry about! I transitioned to all grain brewing in early 2010 where I extract those fermentable sugars myself. I still brew using both methods, but it depends how much time I have: a little time means I'll brew with extract. But I brew from grain (all grain brewing) about 99% of the time. Brewing is actually therapeutic for me. It's relaxing and enjoyable.